What is the difference between ‘political’ and ‘Government’ advertising? 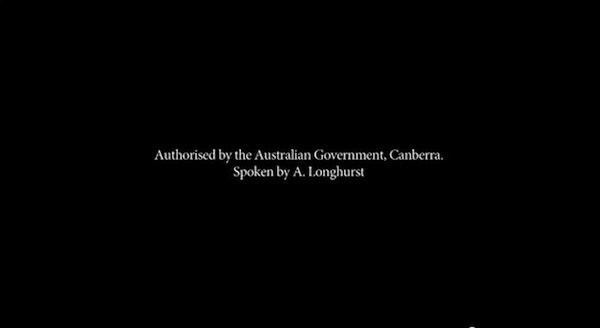 I am sure you are familiar with this at the end of all Government advertising broadcasts in Australia. And that is the point. All Government advertising is considered political advertising in Australia under the current interpretation of the ABA because it is considered that all Government matters are political. But why does that matter? Well for the Government (of either persuasion) this becomes a political football with opposition parties constantly complaining of Governments using Government advertising for political purposes. But beyond this, there is a significant impact on public funds. There is an interesting loading in the MEAA actors agreement for commercial voice overs which states that for political advertising, the rate will be “double total fee”. This is because the identity of the person supplying the voice over is revealed in the ‘required particulars’ and the actor may not necessarily want to be associated with the political message contained in the advertisement. You could argue that the MEAA should change the agreement to drop the loading, as they have done previously with a similar loading for alcohol advertising. But unlike alcohol advertising, the requirement of the ABA means that the actor is named as part of the required particulars. In the ‘Unchain my heart’ campaign for tax reform, this meant singer Joe Cocker was named for singing the lyrics to his song which was licensed for the campaign. The actors argue that the loading is compensation for this loss of anonymity. So it means that at the moment all Government advertising (as it is indistinguishable from political advertising) must pay double the voice over fees of any other advertiser. The fee for a voice over in a 30 second television commercial in more than one state is $880. But the government must pay double this – $1,760 per actor. So a Government health campaign to make the public aware of the risks of obesity, in an attempt to improve quality of life and reduce the associated health costs, will pay twice as much for their voice over services compared to a multi-million dollar brand that is potentially adding to the obesity crisis. This applies to all Government television commercials and all Government radio commercials, plus extra loadings (which are also doubled) for telephony and internet. If you multiply the number of voice overs by the number of commercials by the number of uses you start to get a sizeable cost to the public purse. But if there was a clear distinction between political and Government advertising, then this double loading would not be payable. Until then, all tax payers are paying double the rate of any other advertiser (from the smallest to the global giants) for the same service. In a democratic society there is clearly a requirement for Governments to be able to communicate with the electorate. This could be to inform them of their rights and responsibilities under new or existing laws or Acts of Parliament. It could be to encourage compliance or social change to fulfil the objectives of laws or Acts of Parliament. But not all Government advertising is associated with existing laws or acts passed by both houses. Often Government advertising is simply the current ruling political party using Government funds to promote and curry electoral support for their policies, before or during the process of having them debated in Parliament. We have seen this behaviour with both major parties. Work Choices is probably one of the most notable for the Liberal Coalition and more recently Carbon Tax for the Labor Government. In fact it has been reported that in this Federal Government election year, Government advertising spend has increased 50% according to SMI. There is constant criticism of Government expenditure on advertising from the media, the public and the opposition parties. But imagine if there was a way to separate out the political advertising from the legitimate Government advertising? It seems to me that it simply requires a definition of what is legitimate Government advertising and then all other Government and political party advertising becomes political. If you accept there is a role for Government to be able to communicate, inform and encourage compliance and positive behavioural change to meet the objectives of laws and Acts of Parliament, then the starting point is to define these. There is a big difference between a policy or a bill that is before Parliament and a bill which has been passed by the majority of both houses of Parliament and passed into law. If a party or even the elected Government is wanting to promote the benefits or otherwise of a policy or bill before the House, then that is in the primary interest of that party. The argument that they have the mandate of the people would be ultimately proven by its successful passage through Parliament. Therefore it is reasonable to suggest that advertising this prior to it being passed by both Houses is therefore political in nature. On the other hand, having been passed by both Houses of Parliament, a bill is then considered a law of the land, to be tested and challenged by the judicial system if required, but nevertheless the business of Government is to ensure that all of those citizens who have rights and responsibilities under that Act or Law should be informed of the same and encouraged to comply or benefit. This is Government advertising and would be considered, by any reasonable person, a legitimate cost of Government. On the other hand, political advertising should be considered a cost to the party that requires it. Is this a too simplistic approach? I know that the business of Government is considered complex. But a blanket rejection of legitimate Government advertising to inform the citizens of their rights and responsibilities would only damage democracy. Separating political advertising from Government advertising would immediately reduce the cost of voice over talent and remove the double loading penalty currently paid by the Government of Australia and ultimately the tax payer. But more importantly it would bring clarity to the level of Government advertising investment.